Contact us today to schedule a Free Estimate for our experts to prescribe the best insulation for your needs. Blown insulation is a great option when insulating an attic. 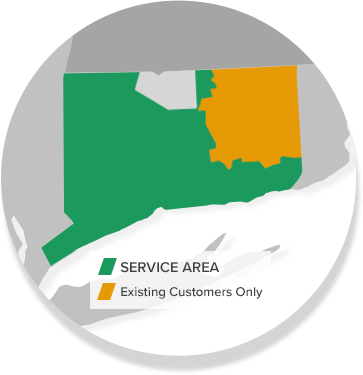 We offer our services in Connecticut throughout Stamford, Norwalk, Hartford, New Haven, Danbury, Greenwich, Darien, New Canaan, Westport, West Hartford, Ridgefield, Hamden, Cheshire, Milford, Trumbull, Shelton, Bridgeport, Waterbury, New Britain, Bristol, Meriden, Glastonbury, Monroe, Stratford and all surrounding cities and towns. Some insulation contractors install blown fiberglass insulation, some install cellulose. We can do both but recommend cellulose in most situations. Cellulose insulation has a similar R-value to fiberglass but performs significantly better in real world tests. It also acts as a better air and vapor barrier. Cellulose is treated to achieve the highest fire rating and for resisting mold growth. We proudly offer a home energy evaluation to properly evaluate what areas in your home are the source of your comfort or energy problems. Once identified, we will provide the best solutions. Need attic insulation? "We will probably have you back in Spring 2012 or earlier to install kneewall insulation." "The crew did a great job and a wonderful cleanup at the end of each day." The crew did a great job and a wonderful cleanup at the end of each day. We offer Free Estimates for attic insulation and the use of blown insulation in Norwalk, Danbury, Stamford, Greenwich, New Haven, Hartford, New Canaan, Westport, Darien, Ridgefield, Hamden, West Hartford, Milford, Trumbull, Stratford, Cheshire, Bridgeport, Waterbury, New Britain, Bristol, Meriden, Glastonbury, Monroe, Shelton and all surrounding cities and towns!